On the 12-mile loop around the Low Country Beaches or on your neighborhood roads, there are few things as awesome and joyous as feeling the blacktop beneath your tires and the wind in your hair. Freedom. Open road. Speed. Except riding a bike can be really dangerous. Statistics don’t lie; in a recent year, there were 35 times more fatalities from motorcycle accidents than there were car accidents. If you or a loved one has been hurt in a motorcycle crash, call Green Law Firm anytime 24/7 for immediate help! When we ride a motorcycle, we’re heading out onto the wide open road virtually unprotected. A helmet or some leather if we’re lucky. There is nothing to come between us and the pavement or the cold and hard steel of another vehicle. The potential for injury is huge! In order for an injured person (known as the plaintiff) to be awarded compensation after an accident has occurred, it needs to be proven that the person who caused the accident (defendant) acted with negligence. This means three things. First… in South Carolina, drivers sharing a road owe each other a duty of care – we owe each other the responsibility of safe driving and behavior while on the road. Second… to prove negligence means to be able to prove that the defendant violated this duty – that they acted in a reckless way. Third… it must be proven that this negligent act caused the accident. Comparative negligence plays a role in how you are compensated! South Carolina follows the idea of comparative negligence. This explains that someone who is partially at fault for an accident occurring may still be awarded compensation. As long as it is less than 50 percent, the plaintiff can be partially responsible and still receive compensation. 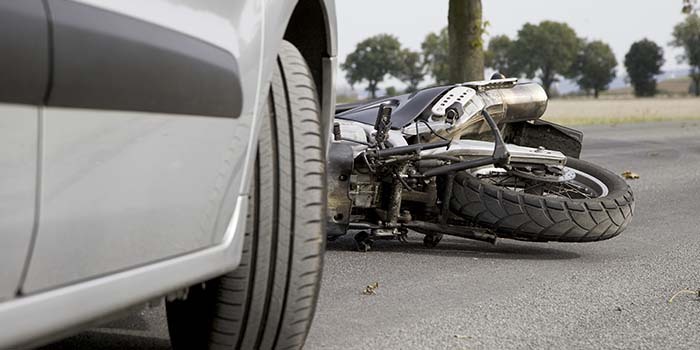 To put it simply, an experienced motorcycle accident attorney will work hard to build a case that shows the defendant was as much responsible for the accident as they could be! And, in turn, that you bear the least amount of fault for the accident occurring. The best way to survive a motorcycle accident… is not to have one in the first place! Here are a few things you can do to stay safer on the road. 1. Don’t share the lane. While zipping through traffic feels great, it can also be really dangerous. Remember, regardless of your skill and experience, most motorists are not looking for bikes on the road; they are looking for cars and large vehicles. A large percentage of accidents come from motorists who make lane changes without realizing a bike is near them! 2. Get real training. Sure, your buddy may have shown you basic operation skills, but approximately 90 percent of accidents occur with riders who are self-taught or taught by their peers. 3. Always ride sober! Drinking and driving is dangerous and illegal. The same goes for riding on your bike under the influence of a substance. 4. Dress for safety. It may be warm and uncomfortable, but always wear a helmet and protective clothing! According to the National Highway Traffic Safety Administration, for every 100 motorcyclists killed in a crash not wearing a helmet, 37 would have survived had they been! Make sure to also have one for any passenger riding with you. Also, wear protective goggles or sunglasses, gloves, pants and boots in an abrasion-resistant fabric that fits close to your body. If you are on this page right now, there’s a good chance you have already had an accident. If so, know that you are not alone and that we can offer you immediate assistance with your case! As with any accident, evidence will be crucial in helping present your case and be awarded the maximum compensation. Compensation that can be vital in helping you return to a natural and everyday pace of life. wages that are lost due to the plaintiff’s ability to work. In addition, if the accident involved a blatant act of negligence, a plaintiff may be eligible for punitive damages. Punitive damages is compensation designed to “punish” a defendant for his or her wrongdoing. Remember, the stronger your case, the higher percentage of compensation a plaintiff can receive! Calling us as soon as possible after the accident… yes, even from the accident scene is important.We will review your case, investigate the cause of the accident, confer with accident reconstruction experts and build a case that will help pay for medical expenses and recover other damages such as lost wages. We will take the burden off you and give you space to heal. Call Bill Green at 1-843-747-2455 in North Charleston.